Bacon Wrapped Potatoes W/ Gruyere! Sweet & Spicy Chicken Bacon Bites! Bbq Bacon Wrapped Onion Bombs! 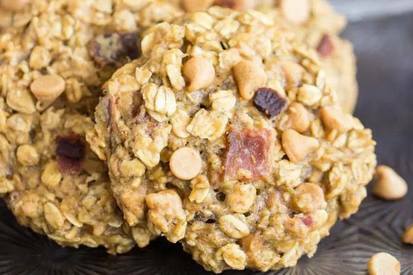 These Peanut Butter Bacon Breakfast Cookies are quick to whip up, and they are lovely for breakfast on-the-go or as a filling snack. I make some variation of my breakfast cookies every few weeks because they’re so handy to have… well, on hand. All of this to say: I’ve never seen a Bacon Breakfast Cookie, and these had to happen. I love my other breakfast cookie recipes, but I’m sure you can guess that these are my favorite.